I know, I know, there are all kinds of delicious cookie butters easily available at Trader Joes and almost any other grocery store. 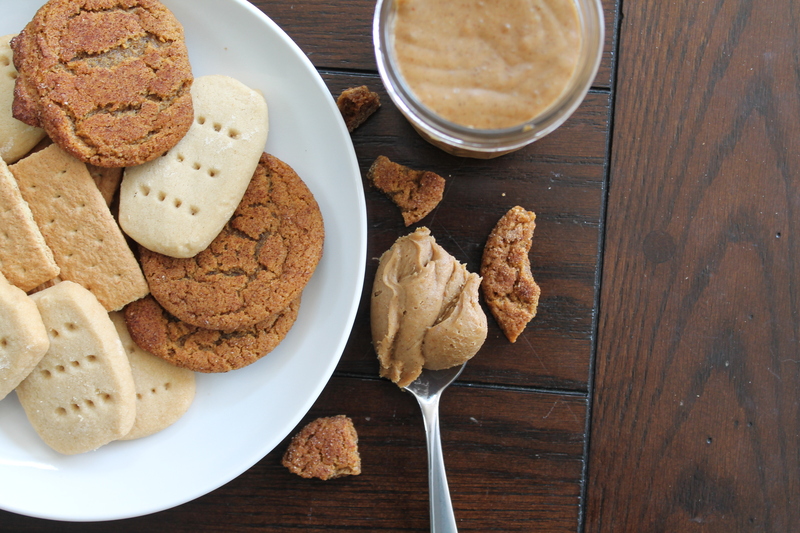 Cookie butter has even branched out from its original speculaas flavor (traditional spiced shortbread cookie originating in Belgium) to include variations like cookies and cream and other sorts of amazingness. This fad has probably played itself out. But I love making things from scratch. So let’s do this. 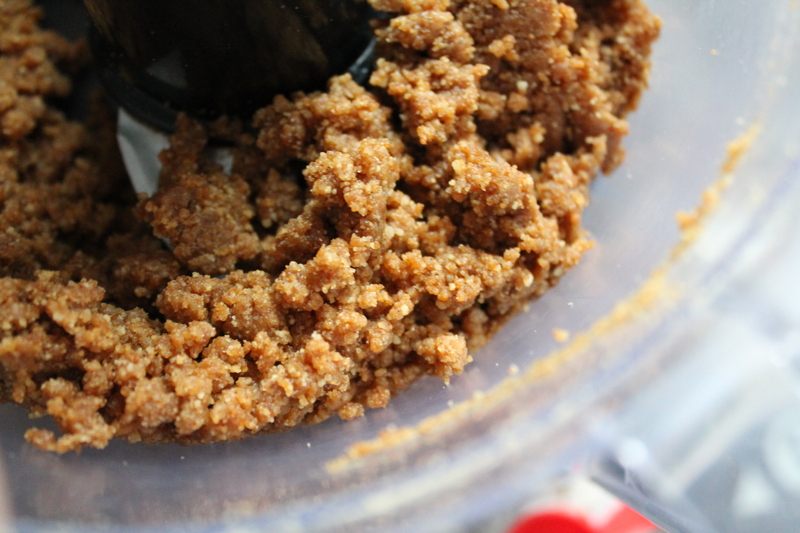 The basic gist is: a huge pile of cookie crumbs, some sugar and creaminess, and whiz until smooth in the food processor. Easy peasy. 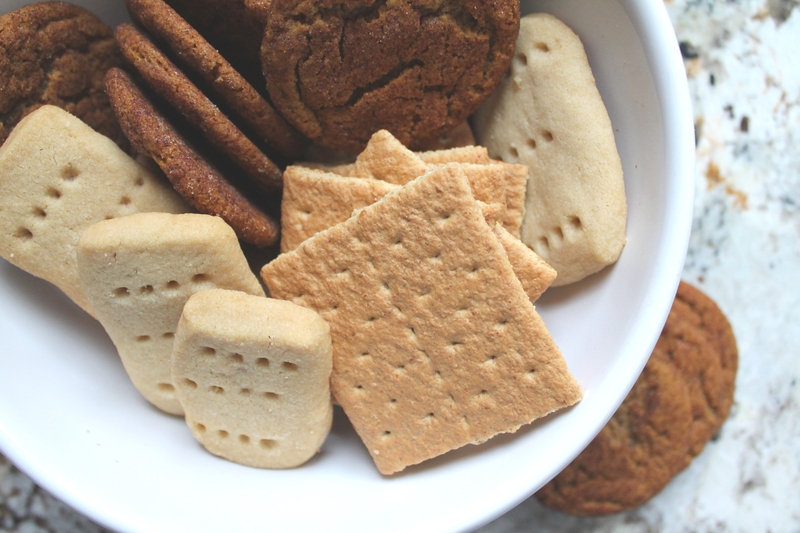 To make the classic, original flavor—but without spending an arm and a leg on a package of Biscoff, because we are trying to make this on our own, darn it!—you will need a combination of gingersnaps (homemade or storebought), brown sugar shortbread cookies, and graham crackers. In all, you will end up with nearly 4 cups of cookie crumbs. Here’s the breakdown: 6 whole graham crackers makes about 14 tbsp. graham crumbs, or just under 1 cup; 7 shortbread cookies makes 1 cup cookie crumbs (it will actually be slightly more, but you can press them down to fit into the measuring cup); and 12 gingersnaps makes about 1¾ cups cookie crumbs. These amounts are measured from freshly ground cookies and crackers, dumped straight from the food processor into a measuring cup. As with fresh bread crumbs, fresh cookie crumbs have a lot of air and moisture, so the crumbs are a bit squishy. If you end up buying pre-ground cracker crumbs, for example, which are much drier and more compressed, you may need less than my measurement. So. 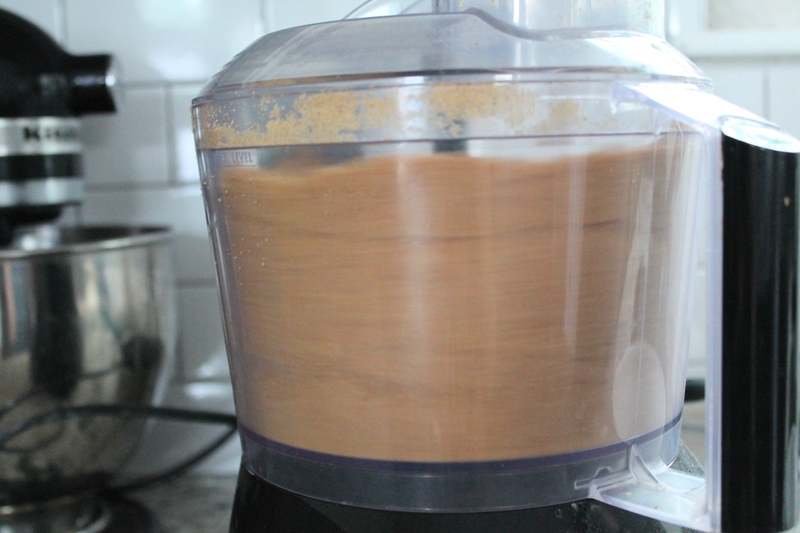 Break the cookies up a little to give your food processor a leg up. 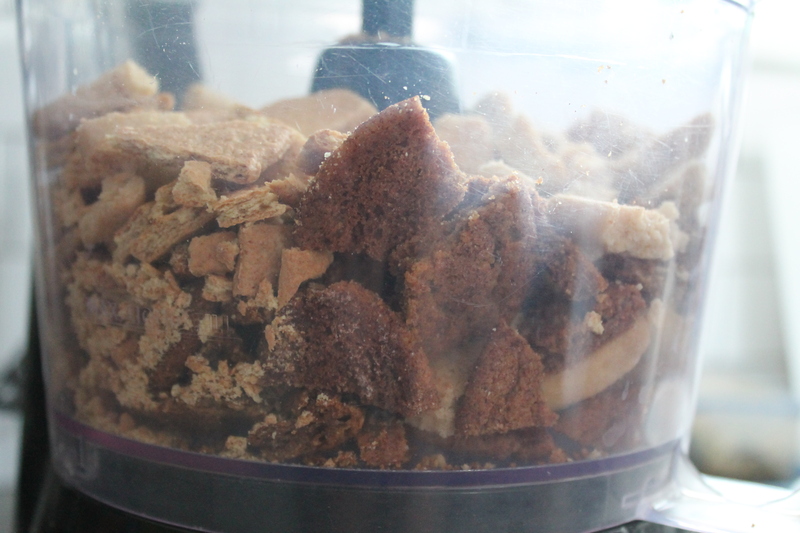 Then…pulverize the cookies. I mean really grind them up fine. 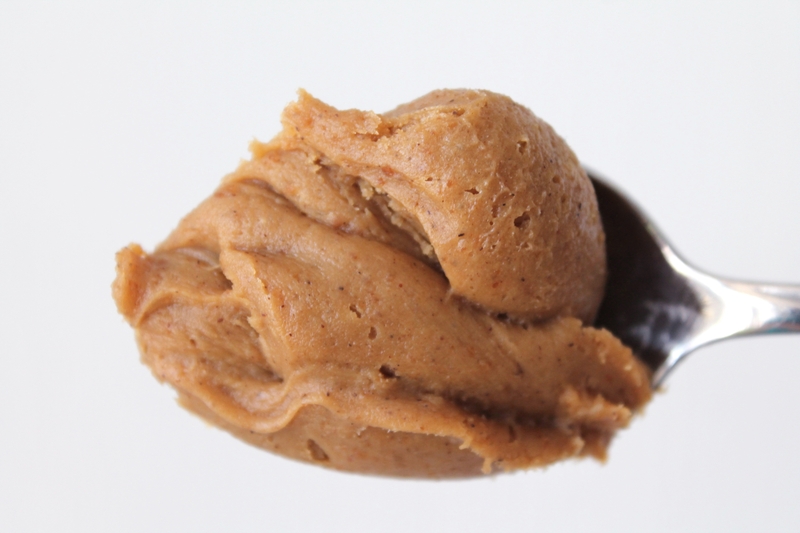 Then add a few tablespoons of water, to help them soften enough to blend into a smooth, creamy spread. Process until the mixture starts to clump slightly, like wet sand. Let the damp cookie crumbs sit for 10 minutes to absorb the moisture. Now add sugar (yes, even though this is made out of cookies…), a pinch of cinnamon and a splash of vanilla! Process this for 10 seconds or so. Pour in some coconut milk. Make sure you are using the really delicious and creamy, fatty kind that comes from the can, not the thin “drinking” coconut milk from the non-dairy section of the grocery store. Process until the mixture becomes thick and smooth. Mine was quite soft and spreadable. Make sure to store this in the fridge, because of the coconut milk! It will keep for 2 weeks (or more) in an airtight container. And, it will even still be spreadable from the fridge. Yum. Of course, if you want to make a different flavor variation, I am all for substituting Oreos or chocolate Teddy Grahams for about half of the gingersnaps! It’s still good to have a bit of the classic spicy flavor (plus, cocoa and spice is delicious, like Mexican hot chocolate), so don’t get too carried away. I like to substitute 1 cup chocolate cookie crumbs (or about 12 original Oreos, no need to scrape out the cream) for 1 cup of gingersnap crumbs (or about 7 whole cookies). 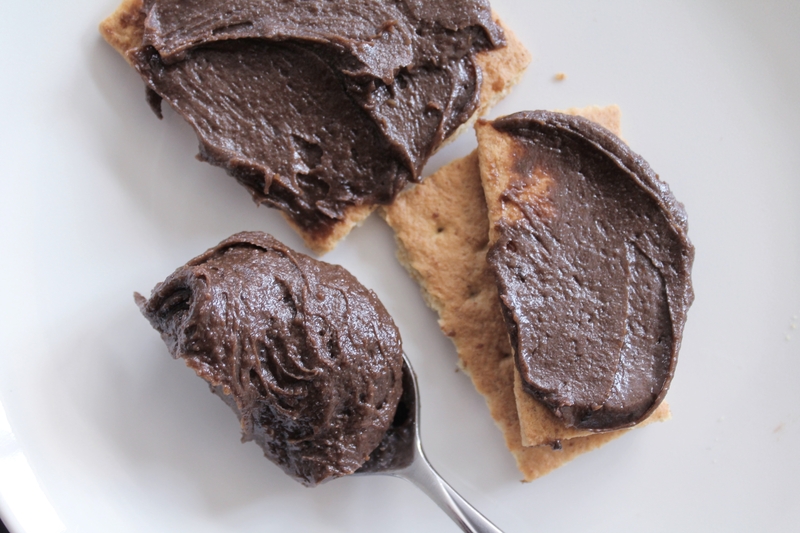 The resulting chocolate cookie butter is lightly spiced and very chocolatey and so, so good. 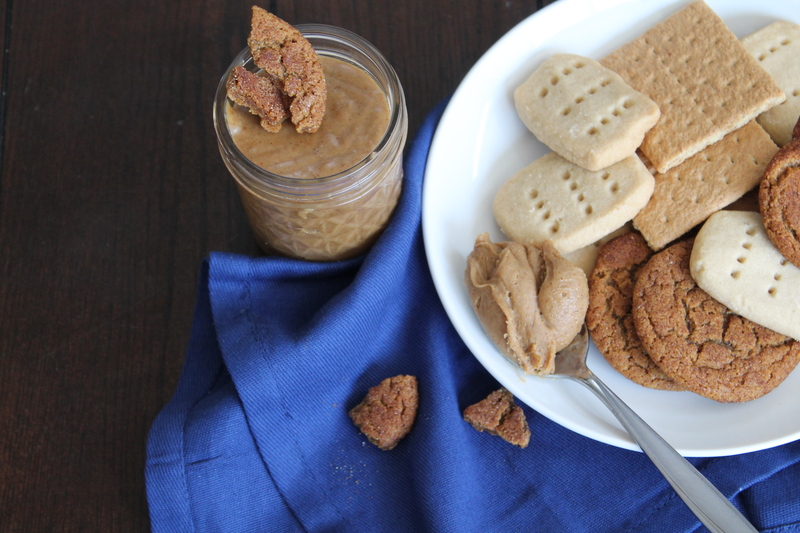 And now that you know you can make cookie butter from about 4 cups of cookie crumbs, the flavor possibilities are endless! Just be sure to aim for crisp cookies rather than soft baked cookies, as they will pulverize better! Roughly crush the cookies and crackers and place them in a food processor. Pulverize until completely fine and even. Add the cold water and process to combine. Let the damp cookie mixture sit at room temperature for 10 minutes. Add the sugar, vanilla extract, and cinnamon, if using. Pulse to combine. With the food processor running, stream in the coconut milk. 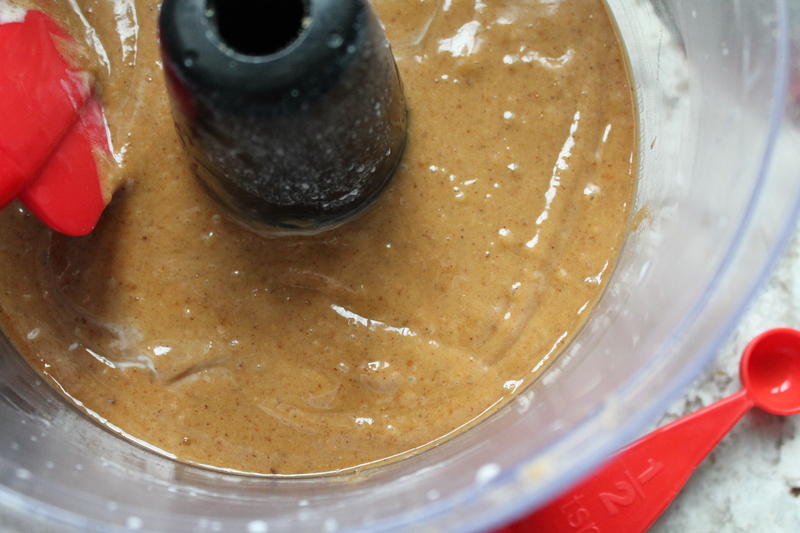 Continue to puree until the mixture turns into a thick, smooth spread. *Note: It is easy to make flavor variations by substituting different crackers and biscuit-style cookies! Make sure to aim for about 4 cups of cookie crumbs, or just under, in total.